Look at how gorgeous this candle is! (see pic above) I also love the pure white wax, it glows so beautifully when burning. 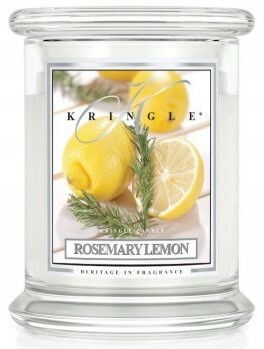 I am a lemon freak and also love the scent of Rosemary so when I saw this fragrance on Kringle’s website. I had to have it. What a perfect pairing! When I received my package, the hot summer heat from shipping melted the top layer of wax on all my candles and out of them all, this fragrance smelled up the whole box. Even my husband noticed while I had the box sitting in my foyer and commented how much he liked it. My whole foyer smelled like fresh lemon with the perfect touch of rosemary… it was perfect! I lit this candle in my master bedroom which is a pretty large room – it took a about 15 minutes to reach a full melt pool (thanks to two wicks) and that’s when I really started noticing the fragrance… after that… the aroma of fresh and delicious lemon and rosemary filled the entire room along with my adjoining open bathroom as well. The scent…. sweet and fresh lemon with the perfect touch of herbs. I LOVED IT!!!!! Every time I walked into the room, I couldn’t help taking deep breathes in appreciation. So fresh and lemony!! Strength – on a scale of 1 to 10, I would rate this a low 7. This candle gave a nice and steady medium throw. I could smell the aroma the moment I walked into my bedroom but the scent never really traveled beyond that. I think it’s safe to say I loved this candle and for sure plan on purchasing more. Being a lemon lover, I’m always on the hunt for nice and fresh ones and this quenched every craving I could possibly have. I also loved the rosemary component. It gave it a nice herbal vibe. So……….. two thumbs up – all the way…. and highly recommend this fragrance to all lemon lovers!! This candle gets 5 stars across the board. It was gorgeous in design, authentic and burned perfect. What about you?? Have you tried Rosemary Lemon from Kringle Candle Co? Review it with us. In the comment section below, review and star rate your experience… it’s easy! 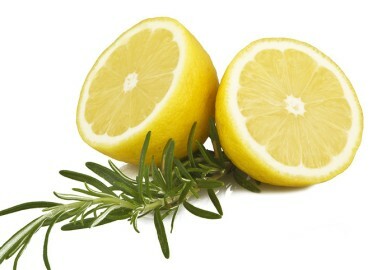 Scent description for Rosemary Lemon - Lavish lemon finds its fragrant soulmate when matched with savory rosemary.